This week saw the official launch of Visit England's ‘Growing Tourism Locally’, a new partnership project to deliver local and thematic campaigns throughout the country. It is claimed that the three year project, aimed at inspiring Britons to take more holidays at home will generate £365million in additional tourism spend and will stimulate employment to grow jobs in the tourism sector by 9,100 over the three years. The project, funded by £19.8m from the Government’s Regional Growth Fund (RGF) with contributions from VisitEngland and the private sector, has now received official sign off from Government and campaigns will start to roll out over the coming months. The investment focuses on working directly with destinations and private sector, to create a number of dedicated marketing campaigns throughout the country with emphasis on specific areas and themes. Themes will focus on what England is most loved for including: Heritage, Coast, Countryside, and Culture including Sport and Literature, with the first campaign launching towards the end of 2012. The total cost of the campaign will be ￡41m including ￡20m from the Regional Growth Fund, ￡9m from VisitEngland and ￡12m leveraged from the national and local tourism sector. options which were produced and created by Stockport-based Juiced Orange Marketing. The advertising will now be displayed around London’s key rail and underground stations aiming to generate late summer, autumn and winter bookings. In late December a second wave of activity will commence hoping to boost bookings in the lead up to 2013 and stimulating jobs in the area. 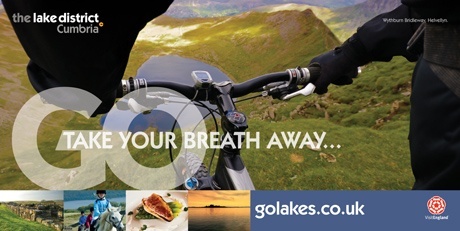 The overall campaign will be fully integrated with Cumbria Tourism’s existing marketing activity and will be supported by digital, PR and thematic campaigns. Visit York, will receive £666,666 from the Government’s Regional Growth Fund as part of a new three-year partnership project, coordinated by the national tourist board VisitEngland.The investment project called ‘Growing Tourism Locally’, aims to inspire more Britons to holiday in England and will deliver a series of campaigns across the country. The funds will be boosted by other partners, including East Coast Rail and City of York Council , to a new £1 million pound campaign over three years. Visit York’s campaign aims to boost the local economy by 5 per cent, an estimated £22 million over the three years, creating an estimated 391 new jobs. UK-wide, the project is expected to generate £365 million in additional tourism spend and create 9,100 additional jobs. Visit York will receive £160,000 in the first year, which will fund a UK wide campaign targeting visitors from London, the South East, Midlands and Scotland. The first wave of activity will persuade visitors to choose York for a winter break between November and March, boosting revenue to the city in the off peak season. Gillian Cruddas, chief executive of Visit York, said: "As a tourism agency, we have worked for over 25 years to promote our great city to the rest of the UK and we are now recognised globally as a world class destination. The RGF funding is a major coup for York and will enable us to take this awareness to the next level and inspire UK holidaymakers to choose York." Marketing Birmingham will be a key partner on the three-year project, which will be a national campaign aimed at inspiring Britons to take more short breaks and holidays at home and in doing so, grow jobs in the tourism sector. Bath’s destination marketing organisation, Bath Tourism Plus, (BTP) is set to invest an additional £1million into promoting Bath and North East Somerset over the next 3 years, as a result of receiving £500,000 from the Government’s Regional Growth Fund (RGF). The additional funding will support marketing campaigns which will seek to attract high spending short break and premium shoppers markets and help grow the value of Bath’s visitor economy. Marketing Leeds has secured over £500,000 of funding from the Government’s Regional Growth Fund to increase tourism to Leeds, increase visitor spend and boost employment in the sector. The programme is expected to grow the value of international conferences, events and conventions and create 300 new jobs in the city and 9,100 jobs nationally. Visit Peak District & Derbyshire will receive £600,000 over the next three years. The tourist body can now press on with its planned strategy, based on the themes of The Great Escape and Active Peak, as part of national tourist board VisitEngland's partnership project Growing Tourism Locally. Not all are happy with these arrangements though. Despite the funding now allocated for Marketing Leeds and Visit York, Welcome To Yorkshire and VHEY will not receive any. Gary Verity, chief executive of Welcome To Yorkshire, said: "We're delighted that funding is being made available for tourism, which is now such an important part of our economy, and we look forward to working with Marketing Leeds and Visit York to grow the tourism economy even further. "However, we do have doubts about this scatter-gun approach to funding and many parts of the country are wondering why they have not received any. "We feel it is a missed opportunity not to give the funding to Yorkshire as a whole to build on the success of Brand Yorkshire." If you are a destination (unlike Yorkshire) and want to get involved there is still time. The project is subject to on-going evaluation and development during the three years, so there will be opportunities available at different stages over this period. Involvement in more than one campaign is also possible if it meets your objectives. It is however important that you contact the VE team as soon as possible stating your interest, even if you are unable to participate in this financial year. To express your destinations interest or to find out more about the campaigns contact Georgina Heathcote, Marketing Partnerships Manager on Georgina.Heathcote@visitengland.org or call 020 7578 1400 or visit the website.